Explore a timeline of Mandela's life and times. Nelson Mandela was known by many names; find out about all his names and their meanings. Watch a video clip of Nelson Mandela on the day of his release from prison on Robben Island in 1990. Find out about Robben Island, and see the small cell where Nelson Mandela was imprisoned for 18 years. Browse a photo gallery of Mandela and read quotes about his determination to fight for freedom for all people. View an online exhibit about apartheid in South Africa in the 20th century. 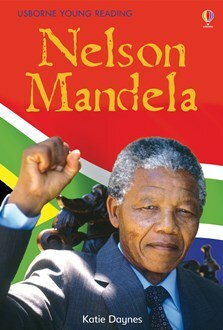 The complete story of the life of Nelson Mandela: one of the most famous names in modern history. Includes insight into Mandela's rural childhood, his time with the ANC, his fight against apartheid, his time undercover as 'The Black Pimpernel', the 27 years he spent in prison and finally his appointment as South Africa’s first black president. A moving story of how a country's most wanted fugitive became its greatest leader. Includes internet links to recommended websites to find out more about Mandela's life and times.